I ate this in Hong Kong for the first time last year and I just could not get the fragrant taste off my mind. 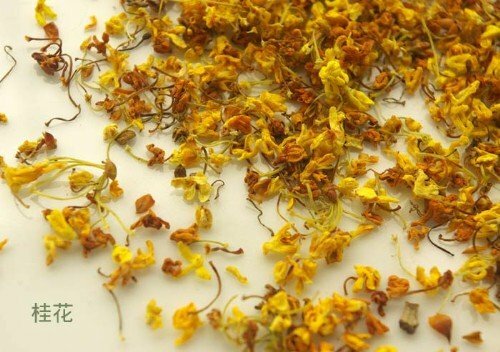 So I came back and searched the shops for this Osmanthus dried flowers. When you open the packet, take a whiff and it will send you to heaven. So I went home to make this dessert. I don't see it selling anywhere in Singapore, let me know if they are and tell me where. In the mean time, I will make do with my own. Fill a medium pot with 1250 ml of cold water. Add the premix konnyaku powder and stir till powder dissolves. Put the pot of mixture on the stove and heat it till it boils. Lower down the heat and simmer. Add dried flowers and wolf berries. Bring to boil again and turn off the heat. Let the mixture infuse with the dried flowers and stand till cool. Pour cooled jelly mixture into container and put it in the fridge to harden completely.